See Updated Version of Navajo Lesson Plan here. “… Further, Vice President Shelly and I, our wives, Speaker Morgan and several delegates among you had the distinct honor of representing the Navajo Nation at the inauguration of President Barack Obama and Vice President Joe Biden on Tuesday. As you no doubt saw on television, the record-breaking inauguration shows how President Obama’s election has restored a sense of pride in our country for millions of Americans. For Navajos, this was perhaps the most important election since President Kennedy occupied the Oval Office. Many of us have not felt such a sense of renewed hope and joyful anticipation at the promise of a new President, and we trust that our voices will at last be heard at the top level of government. The Navajo People believe in President Obama’s call for change in our country. His inspiring statement of belief conveys the same thought taught to generations of Navajos that there are no impossibilities in life. Our grandparents have always told us “T’áá hó ájít’éegó’,” and President Obama’s election shows how true that teaching is and remains. It speaks to Native nations in our determination to do for ourselves, to regain the independence that was lost so long ago, and to hold on to our beloved homelands, languages, sacred songs, ceremonies, and ways of life. While I believe the heart of the Obama Administration is with us, as always, we must begin by telling others who the Navajo People are, and how we live, that Navajoland is the largest among Native nations, equal in size to the New England states of Connecticut, Rhode Island, Massachusetts and Vermont. We need them to know that within the vast space of our homeland are too few employers for our people, thousands of miles of rough dirt roads that are traveled daily, and inadequate means of communication. Ironically, the Navajo Nation is at the geographic center of the fastest-growing region of the United States. We are at the very crossroads of Albuquerque to the east and Las Vegas to the west, Denver to the north and Phoenix to the south. We are a corridor for energy, for food products, for manufactured goods, and for national defense. Railroad cars and interstate highways carry untold cargo and passengers along our boundaries. Truck stops, depots and train stations just beyond our reach to realize any benefit are laden with prosperity meant for others. The solution for our immediate and long-term needs is economic development. Our people want work, and they need work. More often than not they must leave their homeland to find it. That is not as it should be. If Navajos are to remain on Navajo land so that our children continue to speak our language, live our culture and practice our way of life, we must work on our economic development. Rock Navajo Casino to overwhelming numbers and unexpected success. Beyond the goal of generating revenue for the Nation is putting Navajos to work. 1. What are the teachings that older generations of Navajos have taught their children? 2. Name three things the Navajo people wish to maintain in their culture. 3. In paragraph 4 President Shirley states, “… as always, we must begin by telling others who the Navajo People are, and how we live,…” . Who are the others, and why is it important that they know who the Navajo people are? 4. Discuss some of the problems facing the Navajo people today. Can you offer reasons why these types of problems still exist in a country as wealthy as the U.S.? 5. What does president Shirley see as ironic? 1. The Navajo are a fascinating people with a long and interesting history. Historically they were warriors, known for their intelligence. 2. During the 17th century the Spaniards controlled New Mexico. This occupancy resulted in the great Pueblo Revolt of 1680, when the Spaniards were forced out of New Mexico. There is no solid documentation of the role the Navajos played in this revolt, however, once the Spaniards retreated, the Navajos gained control of the territory. 3. In 1694 the Spanish took control of New Mexico again, forcing the Indians in several areas to flee and seek refuge with the Navajos. During the 1700s, disagreements between the Navajo, the Ute and Comanche forced a conciliatory relationship between the Navajo and Spanish, which ended in the 19th century. 4. In 1818, the Navajo people were split into two groups, the eastern Navajos who wanted peace with the Spaniards, and the western group who did not want peace. At this time New Mexico was under the control of a new Mexican government. 5. In 1846, the United States gained control of New Mexico. The Treaty of Guadalupe Hidalgo was created because Mexico lost the war to the U.S.,and so it had to relinquish Texas, Arizona, Colorado, New Mexico and California. A major part of this land included the Navajo territory. Fort Defiance was built in the heart of Navajo country in 1851, and it was here that military operations occurred against the Navajo people. The open land attracted many white American settlers, and the Navajos were forced to negotiate with the U.S. army for their land and water supply. These intrusions led to small battles between the Navajo and U.S. troops. 6. In 1863 an attack was made on the fort by the Navajo leader Manuelito and Barboncito a medicine man and war leader. The Navajo almost took control of Fort Defiance but the army had superior gun power. Later, the fort was abandoned due to the Civil War, but commander James Carleton continued the war against the Navajos, who like the Apache, were considered to be a threat to the Army of the West. 7. During the period of 1863 to 1864 the U.S. war against the Navajo continued. The Navajo were driven from their land by Kit Carson, by destroying their livestock, burning the land, and poisoning the water. One of the reasons was that coal and oil had been discovered on the land. Thousands of Navajo went into hiding in Canyon de Chelly. Carson surrounded the Navajo and moved them to Fort Sumner at Bosque Redondo, New Mexico. This move is known as The Navajo Long Walk. Many recount the atrocities that the Navajo suffered at the hands of the soldiers during this infamous journey. 8. During World War II, all men including American Indians were required to registered for the draft. Although the Navajos were not allowed to vote, they were expected to serve in the U.S, military. The recruitment of the first Navajo Code Talkers occurred during 1942. The code used Navajo words for the English alphabet and military references. For example the Navajo word for whale was the code for “battleship”. The Navajo code was invented by the Navajo soldiers. They memorized the code and became radio operators. Since the Navajo language was unwritten, the Japanese were never able to break the code, as they had broken other American codes. 9. In 1953, the Navajos are granted the right to vote by the state of New Mexico, and other states soon followed. The tribe began publishing the newspaper Navajo Times in Window Rock, Arizona; it is currently a weekly newspaper. In 2008 New Mexico becomes the first state to officially adopt a Navajo textbook, Dine Bizaad Binahoo’aah: Rediscovering the Navajo Language, which is used in language classrooms throughout the New Mexico school districts. Directions: The following sentences are from the reading selection you’ve just finished. Find and highlight each of the following sentences in the paragraphs. Then infer the meanings of the words in bold from the context. Highlight any additional words that you aren’t familiar with and do the same with those. Check your answers with your group members, and then refer to your dictionary or thesaurus to confirm your guesses. There is no solid documentation of the role the Navajos played in this revolt. …once the Spaniards retreated, the Navajos gained control of the territory. In 1694 the Spanish took control of New Mexico again, forcing the Indians in several areas to flee and seek refuge with the Navajos. During the 1700s, disagreements between the Navajo, the Ute and Comanche forced a conciliatory relationship between the Navajo and Spanish. The open land attracted many white American settlers, and the Navajos were forced to negotiate with the U.S. army. These intrusions led to small battles between the Navajo and U.S. troops. During World War II, all men including American Indians were required to registered for the draft. Directions: With your group answer the following questions from the reading. During the 1700s, which groups of Natives had disagreements with the Navajos? The Navajo were split into two groups. What did each group want? When was Fort Defiance built? What were the conflicts between the Navajo and the U.S. military in Fort Defiance? When were the first Navajo Code Talkers recruited? What right was granted to the Navajos in 1953? Where was the first Navajo newspaper published? What was the name of the first Navajo Textbook published? Write an essay in which you express your opinion on the events leading up to and including the Navajo Long Walk. Write an essay in which you discuss the reasons for the current economic problems of the Navajo people. 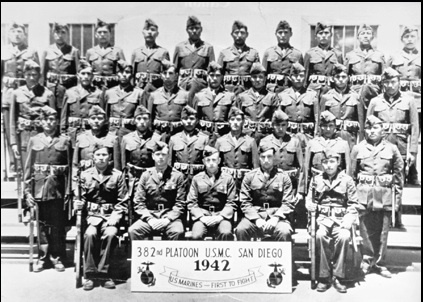 Write an essay discussing the importance of the Navajo Code Talkers and the importance of their contribution to the United States. The first detachment of Navajo Communications Specialists upon completion of their basic training program in May, 1942.Photo- Navajo Code Talkers website. “Philip Johnston, a civil engineer for the city of Los Angeles, proposed the use of Navajo to the United States Marine Corps at the beginning of World War II. Johnston, a World War I veteran, was raised on the Navajo reservation as the son of a missionary to the Navajos, and was one of the few non-Navajos who spoke their language fluently. Because Navajo has a complex grammar, it is not nearly mutually intelligible enough with even its closest relatives within the Na-Dene family to provide meaningful information, and was at this time an unwritten language, Johnston saw Navajo as answering the military requirement for an undecipherable code…One estimate indicates that at the outbreak of World War II fewer than 30 non-Navajos could understand the language. Early in 1942, Johnston met with Major General Clayton B. Vogel, the commanding general of Amphibious Corps, Pacific Fleet, and his staff. Johnston staged tests under simulated combat conditions which demonstrated that Navajos could encode, transmit, and decode a three-line English message in 20 seconds, versus the 30 minutes required by machines at that time. Provide two reasons Johnston recommended the Navajo language for military use. During that time, approximately how many non-Navajos spoke the language? What were the results of the simulated combat testing Johnston staged with the Navajo soldiers and coding techniques? Give two examples of code words the Navajo soldiers invented. A codebook was developed to teach the many relevant words and concepts to new initiates. Why was the text never used on the field? “When the world began, the people lived underground. Far below the surface of the earth, the people dreamed of a light above the ground, and slowly, over many years, they made their way to the sunlight. But once they arrived in the brightness, the people found that life was dangerous. Gigantic birds swept down and seized them. Large animals devoured them. Before long there were only a few people left alive. They crowded together for safety and called to the Holy People for help. Instead of sending help directly, the Holy People sent a baby goddess called Red Shell, who, in four days, grew up to be a beautiful girl. She fell in love with a handsome stranger in the forest, and four days later she gave birth to twin sons, Monster-Slayer and Child-of-the-Water. Red Shell could not tell them who their father was, so they set out to find him themselves. On their search they met Spider Woman, who told them that they were children of the Sun and gave them some feathers to help them on their journey. With these feathers they were able to leap over huge walls, free themselves from grasping reeds, and dodge crushing rocks. Finally they reached the house of the Sun, which was set in the middle of a vast lake. This time the feathers couldn’t help them cross because the distance was too great. “Why do you want to go to the house of the Sun?” asked an old man standing at the edge of the lake. “He is our father,” replied the twins. So the old man created a rainbow bridge over the lake for the brothers to cross. The house of the Sun was magnificent. Its walls glowed blue and green and the roof shone a brilliant white. Bravely Monster-Slayer and Child-of-the Water walked in. At first the Sun did not believe that the boys were his children. He tested them by throwing them down a mountainside, but they survived. Then he tried tempting them with rich gifts of gold, turquoise, and shell, but they refused. Then finally he greeted them as his brave sons. When they told him of the hardships being suffered by their people on Earth, he gave them weapons to fight the monsters and helped them find their way home. Directions: The following sentences are from the story. Choose the definition which best fits the words in bold. Students may wish to use a dictionary, as some of these are challenging. 1. Once they arrived in the brightness, the people found that life was dangerous. Gigantic birds swept down and seized them. Large animals devoured them. a. to swallow or eat up voraciously. c. to be afraid of something. 2. With these feathers they were able to leap over huge walls, free themselves from grasping reeds, and dodge crushing rocks. b. to seize and hold by or as by clasping with fingers. c. to make an attempt to run. 3. They were able to dodge the falling rocks. a. to move aside suddenly, as to avoid a blow. b. to prevaricate when asked asked a question. c. to play a game. 4. Finally they reached the house of the Sun set in the middle of a vast lake. b. a very great area or extent. c. something to place flowers in. 5. The house of the Sun was magnificent. Its walls glowed blue and green. b. something splendid in appearance, surpassing beauty. Directions: Working in pairs, answer the following questions using the words from the family list. Take turns asking each other the questions. Go over the answers as a class. Careful, some are tricky! A: Who is your mother’s mother? 1. A: Who is your uncle’s father? 2. A: What do you call your aunt’s son? 3. A:What do you call your father’s mother? 4. A: Who is your aunt’s father? 5. A: What do you call your mother’s sister? The primary goal of these lessons is to raise students’ awareness of the American Indian people living in the United States today, and to view them as an integral part of American society. My hope is that students will see the native people of this country as workers, students, professionals, parents, and leaders of their communities. The construction of the exercises makes the reading material more of a communicative activity, and helps students better understand the content. There are various pre-reading, while-reading and post-reading tasks for each reading selection. Although the majority of the exercises are suggested for group work, especially during class, students can complete the activities independently as homework assignments. At the following class meeting, their responses can be used as the basis for group discussions. The research activities can also be completed individually or as collaborative group projects. documentation |ˌdäkyəmenˈtāSHən|-noun-material that provides official information or evidence or that serves as a record: you will have to complete the relevant documentation. retreat |riˈtrēt| -verb [ no obj. ]-• move back or withdraw. refuge |ˈrefˌyo͞oj, -ˌyo͞oZH|noun-a condition of being safe or sheltered from pursuit, danger, or trouble: he was forced to take refuge in the French embassy. conciliatory |kənˈsilēəˌtôrē|-adjective-intended or likely to placate or pacify: a conciliatory approach. negotiate |nəˈgōSHēˌāt|-verb-[ no obj. ] try to reach an agreement or compromise by discussion with others: his government’s willingness to negotiate. intrusion |inˈtro͞oZHən|-noun-the action of intruding: he was furious about this intrusion into his private life | unacceptable intrusions of privacy. draft |draft|-noun-(the draft) compulsory recruitment for military service: 25 million men were subject to the draft | [ as modifier ] : draft cards. 1. During the 1700s, which groups of Natives had disagreements with the Navajos? In 1694 the Spanish took control of New Mexico again, forcing the Indians in several areas to flee and seek refuge with the Navajos. During the 1700s, disagreements between the Navajo, the Ute and Comanche forced a conciliatory relationship between the Navajo and Spanish. 2. The Navajo were split into two groups. What did each group want? In 1818, the Navajo people were split into two groups, the eastern Navajos who wanted peace with the Spaniards, and the western group who did not want peace. 3. When was Fort Defiance built? Fort Defiance was built in the heart of Navajo country in 1851. 4. What were the conflicts between the Navajo and the U.S. military in Fort Defiance? Fort Defiance was built in the heart of Navajo country in 1851, and it was here that military operations occurred against the Navajo people. The open land attracted many white American settlers, and the Navajos were forced to negotiate with the U.S. army for their land and water supply. These intrusions led to small battles between the Navajo and U.S. troops. 5. When were the first Navajo Code Talkers recruited? The recruitment of the first Navajo Code Talkers occurred during 1942 (World War II). The code used Navajo words for the English alphabet and military references. 6. What right was granted to the Navajos in 1953? In 1953, the Navajos are granted the right to vote by the state of New Mexico, and other states soon followed. 7. Where was the first Navajo newspaper published? The tribe began publishing the newspaper Navajo Times in Window Rock, Arizona. 8. What was the name of the first Navajo Textbook published? In 2008 New Mexico becomes the first state to officially adopt a Navajo textbook, Dine Bizaad Binahoo’aah: Rediscovering the Navajo Language, which is used in language classrooms throughout the New Mexico school districts. Johnston was not Navajo, but he learned to speak Navajo fluently because he was the son of a missionary who worked closely with the Navajos. Navajo has a very complex grammar, and during this time it was still an unwritten language, it fit the requirement for an undecipherable code. Approximately 30 non-Navajos could understand the language. The results were that the Navajo soldiers could encode, transmit, and decode a three-line English message in 20 seconds, versus the 30 minutes required by machines at that time. Two examples of codewords were the word for “potato” being used to refer to a hand grenade, and “turtle” to a tank, for example. The book might have fallen into enemy hands. 3. A: What do you call your father’s mother? B: I call her grandmother. 5. A:What do you call your mother’s sister? B: I call her aunt.